Gmail Sign Up - Create your Gmail.com account now! Create a new Gmail account - Learn the sign up steps! Today, more and more people use Gmail as their primary email service. If you also want to join the hype and move to the service, you need to know how to register to Gmail. Honestly, I think Gmail sign up is one of the easiest email registration processes out there. The big advantage of Gmail is that it's really easy to create a new account. Within no time, you will be able to use your new mail account! How to sign up for www.Gmail.com? 1. Go to https://mail.google.com/ and you will find a registration forms with columns that you have to fill up with your personal information. The Gmail sign up form will ask you to mention your personal details such as name, preferred username, password,. date of birth, gender. cellphone number, and your current email address. 2. Type your first and last name on the name column. If you don’t have any surname and your name only contains one word, just type your father’s name on the given space. Alternatively, you can just type - to indicate that you don’t have last name. 3. Type the email address that you desire. Make up a unique email address that will both be original and easy to remember. For a formal email address, most people tend to use their first and last name combination. Remember, your name may not be as original as you think so perhaps somebody else with the exact same name has already completed a Gmail sign up process before you. If this happens, you certainly cant use the login name. However, on Gmail you can use the combination of alphabets, numbers and period. So for instance if I want to use elizabethtan@gmail.com as my email address but don’t succeed because somebody else has picked up the screen name, I can try elizabeth.tan92@gmail.com or any other combinations until I find one which is available to use. Remember, capital letters have no effect on Gmail addresses. 4. 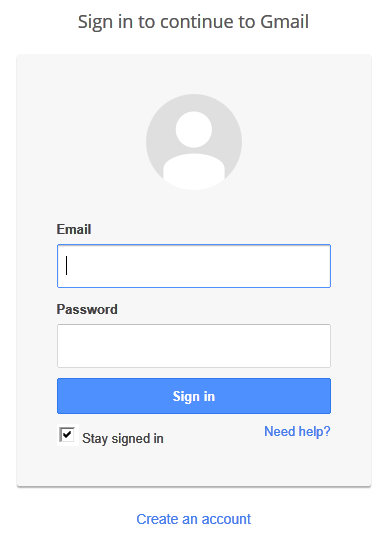 The next Gmail sign up step is to create a password for your Gmail login. Password is used to secure your account as well as to identify if its really you who attempts a sign in. On Gmail, your password should at least be 8 characters long. It is better to use a combination of alphabets and letter. The longer your password is, the more difficult it is for cyber criminals or people who know you to guess. Remember; don’t use your date of birth, cellphone number, school name, pet name, or other personal information which can be easily guessed. Make sure your Caps lock key is not on since the password is not case sensitive. 5. Confirm your password. Re-type the password that you have chosen for your email address. Be certain that you type identical password or you will not be able to proceed to the next stage. 6. Fill in your date of birth on the provided space. The Gmail sign up step cannot be skipped. Pick your date, month and year of birth. Gmail will never be able to tell if your birthday information is incorrect, so if you feel uncomfortable telling this personal detail, you can pick random date. 7. Choose a gender that you feel most identify with. 8. Fill in your cellphone number. You can skip this process. However, this will be useful for account verification or password recovery procedure. 9. Write your current email address. This means the email address that you’ve been using before you decide to do a new Gmail sign up. If you don’t currently have any email addresses, just skip this. 10. 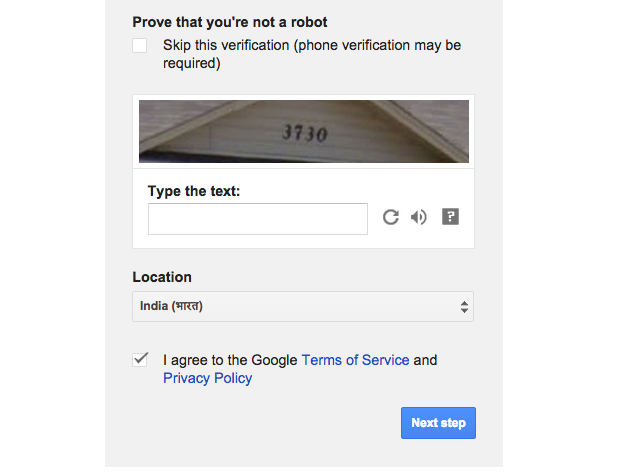 Prove that you are not a robot by following the verification procedure. 11. Pick a location where you currently live. 12. Put a tick on the box near the statement of agreement. Your Gmail sign up is done. Next, you can customize your account by uploading a profile picture or creating a Google+ account.